Does the change of seasons have you itching to refresh a tired, lackluster room? Here are some of this season's most buzzed-about trends and how you can incorporate them into your next project. Wood is the new neutral. This season's strong trend toward wood textures pairs the warmth, richness and texture of real wood with limitless design flexibility. Think wood-textured textiles, tree-printed wallpapers and embossed soaps that look like wood. Installing engineered wood ceilings and wainscoting can bring the unique look of reclaimed wood into any environment—an easy do-it-yourself project with striking results. Ode to the elements. Mother Nature is inspiring design in a big way this year and homeowners are finding unique ways to incorporate rocks, minerals and other natural elements into their home's design. Try replacing a common-place item like an alarm clock with one encased within a multi-colored agate. Bring this look to the kitchen with a stainless steel backsplash, or swap out run-of-the-mill hardware with mineral-inspired drawer pulls and knobs. Shore thing. Homeowners, inspired by the calm, care-free attitude of coastal living are all about bringing the beach inside this season. Beach-inspired design elements are popping up throughout the home. Weathered and white-washed wood ceilings are a subtle but stunning on-trend addition—especially when finished with interior accents like decorative shells, drift wood furniture and marine-themed prints. Contrast in texture. Step aside Pantone, texture is spring's hottest new color. Homeowners are adding interest to their homes with texture through high-gloss finishes, metallics, sequins and mirrors. A textured tile wall brings visual and tactile interest, especially when paired with contrasting high-gloss lacquer or low-gloss matte accessories. Visual punch. Reawaken the senses this spring by incorporating a striking visual element to the home. Multi-dimensional surface treatments in pearl, metallic and gold/silver combinations add panache as a coating used for hardwood, or can be applied to wallpaper, furniture or decorative accessories. 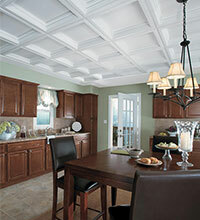 And don't forget to look up—coffered ceilings will look impressive in any room. Manipulated metals. The versatility of manipulated metal makes it a great addition to any style home—from hand-crafted artisan to contemporary high gloss. Copper, pewter and nickel are getting in on the action and can be styled in a variety of ways, including hammered metal sink basins, tin-look ceiling tiles, antiqued copper light fixtures and brushed stainless steel cabinet hardware.